Indian cuisine is a riot of colours, flavours, and spices. Every state has its own unique culture- ingrained taste bud. And, to many of us staying within familiar tastes is a sacrosanct act. Of course an occasional trip to a speciality restaurant that serves another fare is ok. But, as a matter of routine ...at home...NO! I love food! Be it traditional or fusion, cooking is all about turning out fare that is tasty and healthy.I welcome all lovers of good food to come on aboard and share your kitchen adventures. If you like what you see, do leave a comment. If you don't, please leave a suggestion to help me make this better. You can also request for any recipe you want. Just leave a note in a comment box. My college mate, Annu, lives a few kilometers away from us at Muscat. We had a small family get together at her place last weekend. I made a little batch of these yummy cookies for her. I made up the recipe with ingredients I had in hand. Powder the peanuts into meal using the chutney jar of your mixie or a coffee grinder. Pour the egg and butter into a blender jar and whisk till frothy. Add the sugar and cocoa. Blend again. Add the baking soda and whisk once more. Add in the vanilla. Pour out into a vessal and add in the peanut meal and flour. Incorporate well. If the batter is too thick add a little warm water. Preheat an oven to 200°. Line a baking tray with aluminium foil or parchment. Pour out the batter by the spoonful with enough spacing (this one expands quite a bit). Bake at 150° for 18 minutes. PS: The cookie is quite soft when hot and hardenes to crumbly perfection when cool. 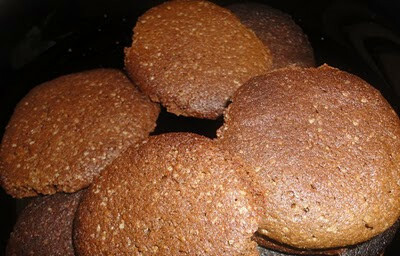 Hence, watch out for the colour and the lovely aroma as baking indicators and not texture. The crumbly peanut and chocolate cookie recipe goes to theKid's Delight - Chocolate Feast event on at Srivalli's Spicing Your Life. Cookies looks soo irresistible and inviting..
Love the combo of peanut and chocolate,cookies looks great dershana! want to eat them right away. Like what you see ? Why not subscribe to recipes via email ?